Welcome back to the late Victorian Era and our all new “interactive” culinary adventure! The things and ingredients for Episode-3 have the story rolling along as they building the plot and characters. Keep an eye out for informational links in the text and with some of the images too. The dapple mare Ignatius Belle loaned me cantered at a pace that seemed comfortable for the horse. We traveled along a river. Water lapped gently against the shore making a soothing sound. I reigned in the mare, stopping under a large shade tree beside the main house of the Hixon estate. For a moment I considered how I should approach a frightened child. I decided to simply knock on the front door. I expected that convention would outweigh Copper’s skittishness, especially within the familiarity of her home. After all, when there was a knock at the door, one tended to answer it. Though it irked me, I dressed in socially acceptable feminine attire. Under the circumstances I realized that was best. 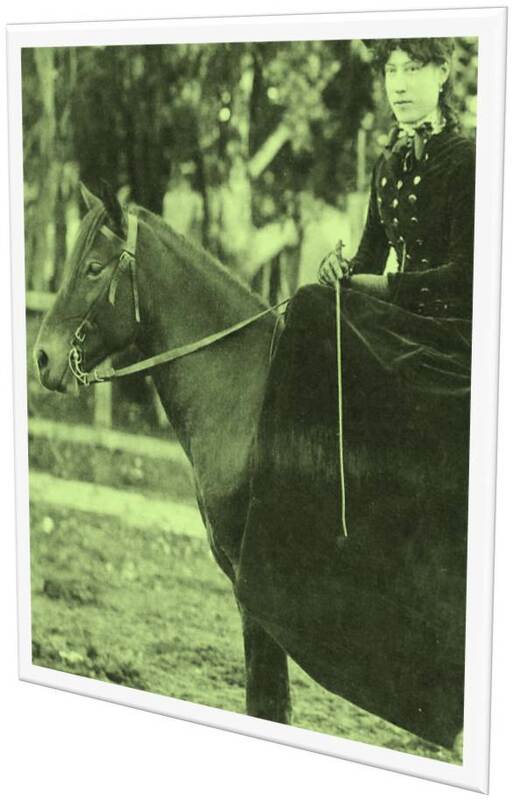 However, I still refused to wear a corset, and I absolutely did not ride sidesaddle! If someone was upset about the sight of a bit of stocking showing above my boots, then they could look away. After I dismounted the horse, I adjusted the full skirt and bustle. The dark green and cream colored stripes were attractive, even if the design was utterly impractical. I touched the smaller lady’s version of my favorite top hat. It sat at a jaunty angle on my head, and was adorned with ribbons, feathers, and tulle. Through the multicolored stained glass inset on the door I saw the shape of a small person approach after I knocked. Sure enough, the door opened just a crack. Although I thought I already knew the answer to the question, I asked if Mr. Hixon was available. “Um… no. No ma’am,” Copper said through the crack in the door without giving further information. “Oh, that’s unfortunate,” I dissembled. “I had an appointment with him. I’ve come to apply for the governess position,” I said, hoping that Copper felt the need to have a grownup around. While I knew nothing about children, I expected that most youngsters who had nothing to eat and a dead body in the study would like to have an adult to fix things. I held up the basket of calamari and rolls. “I’ve brought my lunch, but there is too much of it. Perhaps while I wait for Mr. Hixon, we could share it. Maybe in the kitchen?” I suggested. Cornelis had mentioned that the study and the kitchen were on opposite sides of the house. I hoped the idea of me being in the kitchen would seem less threatening to the girl than letting me into another part of the house. Indecision painted her face, along with the smudge of dirt I saw on her nose at the general store. She bit her lower lip as she looked from the basket and back up at me. The aroma of its contents was making me hungry again, so I knew her mouth must be watering. A gurgling noise came to my ears. That was surely her stomach growling. “Yes. You know how busy your father is. He’s been looking to get a new governess to help with things, and to help look after you,” I said, hoping she had liked her former teacher as much as I expected. Hixon wasn’t likely to have written the glowing recommendation Cornelis mentioned if the child didn’t like her. “Um,” she began and licked her lips. “Won’t you please come in,” she said in a rehearsed formal way. “But you must make sure not to disturb my father,” she added with a frightened look in her eyes. When I crossed the threshold I detected an unappealing scent. It smelled like sweet oil, overlaying a vague odor of something that was rotting. Forgetting my resolve to take things slowly, I turned to follow my nose. Copper gasped and grabbed my hand and pulled me toward the kitchen and away from the odor. As might have been expected the kitchen was a horrendous mess of dirty dishes and disastrous attempts at cooking. The shell of a quail’s egg lay on the floor. Flour covered the work surfaces, part of what appeared to be an unsuccessful attempt at pancakes. By the look of things, Copper must have been on her own for a while. By the time I recovered from the shock of seeing a kitchen in such a state, the moppet had already eaten most of the food I brought. The poor thing was ravenous. I twitched with a shudder when the disembodied voice of Cornelis was suddenly in my ear. He warned that someone was coming. I could hear him more clearly than I usually could when he sent his voice without his body. Usually his voice sounded rather far away in this circumstance, but at that moment he was loud and clear. However, I heard a distracting faint chiming sound in the background and I wondered what it was. “Who said that?” Copper asked with a start. It surprised me that she heard him. I told her that it was just a friend, but she pelted out of the kitchen. I followed Copper as she ran to the front parlor to look out the window. A small coach and a man on horseback approached. Cornelis spoke into my ear again stating that the rider was the sheriff. I asked who would be in the carriage, but he didn’t know. Copper must have thought I was speaking to her. “The orphanage,” she whispered wide eyed. She looked likely to run again. I knew I’d never catch her in that retched skirt and bustle I was wearing, so I quickly took hold of her hand. “Don’t worry. Whoever it is, I won’t let them take you,” I assured her. Copper looked up at me with frightened eyes that were filled with tears and a spark. That spark seemed like a trace of hope that I sincerely would protect her. How could anyone resist that face? However, I needed information, and I needed it fast. The slow approach was no longer possible. “Is there some other reason why the sheriff might be here?” I asked. “What about your father? Are you sure he’s just busy? Is he… Is he well?” I asked the scared girl. Her eyes moved to the direction of the study, where Cornelis said a dead man was slumped at her father’s desk. “Copper has anything happened to your father?” I asked. I realized that I might be pushing too hard, but I tried to make my voice gentle. “Is he in the study?” I asked and that was as close as I dared come to asking if her father was dead. That surprised me. “That isn’t him in the study?” I asked much too bluntly. “It’s alright,” I reassured her, but I had to hurry and get some facts before the sheriff came into the house. “How can you be sure that isn’t him? You didn’t see his face did you?” I asked. As soon as I said the words, I wished I could take them back. Cornelis was right in saying that I spoke before I thought. It was a poor choice of words, but Copper didn’t react as strongly as I feared. “No. His hair. Daddy doesn’t have hair like that. His is gray and thin,” Copper said. The voice of Cornelis supplied the detail that the corpse had luxuriant brown hair. Then he reminded me about the signet ring. “Darling, have any relatives come to visit? The man wears a family ring like your fathers. Does he have brothers, nephews?” I had to ask since it was only hearsay that there was no family. Copper shook her head, unable to take her eyes away from the view of the coach and the rider. The coach driver climbed down, ready to open the door and help his passengers alight. I turned away from the window and took a step toward the study. There was no more time to handle the delicate situation in a slowly paced, gentle way. I had to investigate the room where the unknown corpse rested immediately; else I might never get another chance once the sheriff was on the scene. A pop sounded and Cornelis Drebbel was suddenly in my path. I ran right into the Dutchman. Copper gasped. It wasn’t like the alchemist to reveal himself to anyone. I thanked the stars that Copper had only gasped. She might well have screamed loud enough for the sheriff to hear. I was sure that he and the coach would be at the gates by then. With a flourish Cornelis bowed and took my hand. That was also unlike him — behaving flirtatiously with me, I mean. “You will need this,” he said and placed a beautifully carved ring on my finger. “Cornelis, what—?” I began, dumbfounded. Could the Dutchman have lost his mind? I didn’t get to ask him at what foolishness he was playing, because he pointed dramatically at the window. “You will need this,” he said of the ring but before I could comment he continued. “The people who are about to step out of the carriage? The moppet is correct. They are from the orphanage. And the presence of the sheriff indicates that they have a serious purpose,” Cornelis said. Copper shrieked. The child didn’t utter a word when the alchemist materialized out of nowhere. But mention an orphanage and she screamed. All I could do was shake my head. I hoped she wasn’t heard outside. I ran to the study. To my surprise, Copper followed even as I opened the door and entered the room where the dead body was. The smell of sweet oil was almost overpowering. It was as bad the odor of the corpse. I saw the empty oil bottle lying on the rug at his feet. Then I noticed that the back of his head looked greasy, and an oil stain ran all the way down the back of his waistcoat. I almost laughed. “Copper, did you pour the sweet oil on him?” I asked the child who stood a foot behind me. “He stank,” she said simply but emphatically. I hurriedly scanned the room for anything obvious. However, I wasn’t sure for what I should be looking. Neither was I certain of my purpose in this situation. I had been drawn to this place for a reason, but it was unknown to me. I didn’t think my purpose was merely to solve the riddle of the dead man at the desk. First things first, I told myself as I turned my attention back to the body. I had expected to see a pool of blood, but the top of the desk was clean. The dead man’s left hand rested on the desktop. Something seemed wrong about the position of the hand. It had been moved. Hadn’t Cornelis said he wore a signet ring? Without looking I could feel the cool metal of the ring the alchemist placed on my finger. “You’ll need this,” he’d said. My eyes went back to the naked hand of the dead man. “You moved a ring from the finger of a cadaver and put it on my hand?” I exclaimed, but Cornelis was nowhere to be seen. There was no telling what Cornelis was talking about with that comment. I thought he must have been saying something silly to get the child’s mind off the situation. I hoped Cornelis would be responsible in looking after Copper. He wasn’t always reliable. An official seeming knock sounded at the door. I took a breath and moved to answer it. The “visitors” were clearly surprised to see me, particularly the people from the orphanage. They included two women and a man. The man, who was standing farthest back, mumbled that there was not supposed to be anyone there except the child. I got the impression that he had plenty of courage to accost a child, but not so much if he had to confront an adult. 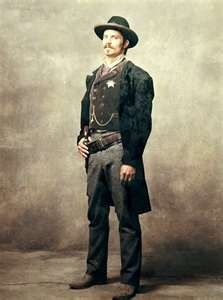 The sheriff was an ordinary looking man, with the exception of the shiny badge and a thick mustache. He had the air of a man who was simply doing his job. He glanced at my stylish frock and seemed to notice a horse hair that clung to my cuff. He bowed over my hand in a formal but obvious ploy to get a good look at the signet ring. I introduced myself as Copper’s aunt, her father’s half-sister, Mina. Yes, Mina. That was the first name that came to mind, though I’ve no idea why. Of course my assertion was met with astonishment. However, Calvin Hixon had not been born in the little town. They couldn’t know much about the extended family. At least the sheriff seemed to think it plausible enough. He glanced again at the ring on my finger and nodded his head. Whatever these orphanage people were about, from the sheriff’s point of view, a long lost relative showing up would simplify things for him. I raised one eyebrow expectantly when none of them introduced themselves in return. The sheriff understood, but the other three silently — and arrogantly stepped across the threshold. The sheriff cleared his throat and they hesitated. “Pardon my lack of manners,” he said awkwardly and began making quick introductions. The county sheriff was Alvin Bullard, also part owner of the local grist mill. The other man was Claude Dinkley, a board member of Merciful Haven Orphanage, as well as the county truant officer. 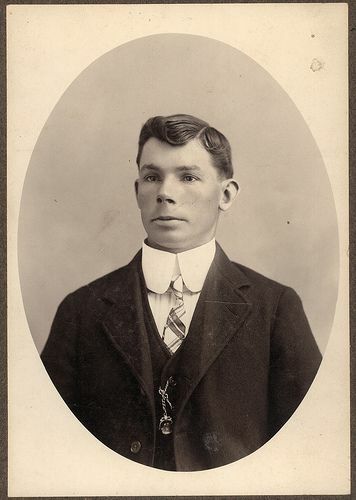 He had a slim build, a weak chin, and his starched collar was too tall for the length of his neck. He also looked like he’d tremble in fear of one of the women. That woman was Ethel Farthing, chairlady of the board and owner of the Merciful Haven Orphanage. She was of average height and build. Her movements were stiff and choppy, though she did not appear to be arthritic. Ethel Farthing positively radiated bossiness and was the first to shoulder her way across the threshold uninvited. She made a sarcastic comment at which the other woman gave a honking laugh. Which brings me to the last visitor. She was a tall willowy woman, Gertrude Hobbs, administrator of the orphanage. Her wire rimmed spectacles sat far down her nose. She was very quiet, but nodded sharply to everything Ethel Farthing said. She had a small head with a prominent nose and a long neck. 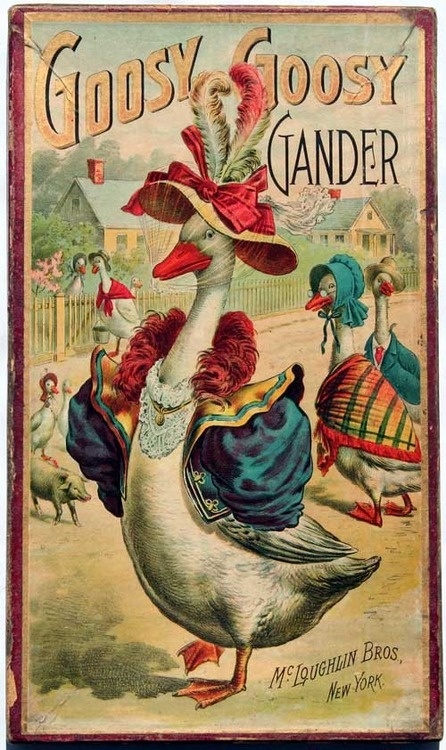 Those features combined with her honking laugh and the large bustle of her gown reminded me of a goose, a greedy goose waiting for a chance to peck away at something. But why were those people here at all? How could they know Copper was on her own? Did the authorities already know something about Calvin Hixon’s disappearance? Why did they have such an interest in Copper? Although I supposed if they established themselves as her guardians, they could take over the Hixon estate. They looked like a covetous lot. They were likely unaware of the financial problems Cornelis discovered. As I motioned toward the front parlor where I planned to lead them I saw the sheriff’s nose twitch. I had not anticipated him being an experienced lawman. He recognized the odor of decomposition beneath the heavy smell of sweet oil. His hand moved to the holstered gun on his hip as if reflexively. He gave me a cold look. “Is there some problem here, Miss?” he asked levelly. There was little I could do, except tell the truth — mostly. “Actually Sheriff, there is. I arrived only a short time ago,” I began and I saw him take note of horse hairs that stubbornly clung to my gown. Hopefully my unkempt attire corroborated that much. “And I came into a terrible thing. I’ve spent all my time trying to calm the poor child. She was in hysterics. Heaven only knows what she’s been through,” I said with a grain of truth. “Do continue,” he said flatly when I paused. He was definitely the no nonsense type. “I found a stranger in my brother’s study. The child has been too distraught to tell me what happened or where her father is. I assumed he went into town to get help,” I said, though it didn’t look like the sheriff believed that. “What stranger?” Gertrude, the bird-like woman asked. “No doubt another long lost relative,” Ethel Farthing, the more aggressive woman said before I could answer. I chose to ignore the people from Merciful Haven as much as possible and focus on the sheriff. I only wished I could ignore the doubtlessly ironic way the facility was misnamed. Sheriff Alvin Bullard was the one with the real authority. I led the sheriff to the study. The others followed. They gasped and nearly retched when they walked into the room. “Nothing appears to be amiss,” I told Sheriff Bullard, and hoped against hope he would not to the kitchen where it looked like Armageddon had been fought. “Well except of course for… I assumed the poor man was struck by a sudden death, a heart attack, or a stroke perhaps,” I said with a distraught wave toward the dead body, trying to give the impression that I was just a helpless woman. Making my eyes as wide and sad as possible, I looked up at the sheriff. Oh yes. That had him. His shoulders relaxed and he took his hand away from the gun at his side. He gave the corpse a cursory inspection. The orphanage people recovered themselves enough to start complaining about my presence. Their assertions about concern over the welfare of the child sounded hollow at best. Based on the expression on the sheriff’s face, he thought so as well. “No sign of a struggle,” the lawman murmured as he looked at the body. “No apparent injuries, no blood from an attack,” he observed. Then he took a close look at the man’s face and at the desk and nodded again. “No traces of vomit to indicate poison. Not so much as a hair out of place. I have to agree that the poor soul must have died from natural causes,” he said with a due amount of reverence and he looked at the others as if silently suggesting they follow his example of decorum. “You said you attended the child,” he said to me and I nodded. “I’d like to speak to her,” he added. I made a reluctant, concerned face. “I’ve only just given her a tonic to get her to sleep. It would be best not to wake her. Perhaps I could bring her to your office tomorrow?” I suggested and Sheriff Bullard reluctantly agreed. The others were not so amenable. A veritable caterwauling ensued. They demanded to see Copper and determine her welfare for themselves. Then they demanded some kind of identification from me. Fortunately, it was in no way unusual for a person to be without such documents. The voice of Cornelis whispered into my ear. “Prime these fools for what I’m about to do,” he said but I couldn’t ask what he meant. Thankfully he continued. “Get them to face the corpse, and say something about making the dead unhappy,” he said. I couldn’t imagine what the alchemist had in mind. However, I moved to stand behind the body so they would have to look at it. As my words ended, a shrill harmonic sound vibrated. It seemed to be within my own ears, but I saw everyone else react to it as well. The sound escalated into loud eerie music that thundered within the room. The volume was so strong that it vibrated through the floor and up through my boots. I felt as though I stood in the middle of a gigantic cathedral pipe organ. I finally understood the exclamation Cornelis made when he entered the back parlor. He’d found a Wurlitzer organ and was using it to grand effect. Somehow he had amplified the sound and made it seem to come from within the study. A glint of silver caught my eye, and I spotted the ornate bell Cornelis took from the inn — the one he said was actually not an ordinary bell, but a harmonic tuner. Bass notes emanated from the Wurlitzer in an ominous way. When he managed to add a sound like a howling cry on the wind the people from the orphanage nearly trampled the sheriff trying to get out of the study. They stumbled and fell repeatedly in the hallway as they made for the front door. The sheriff looked rather confused by the loud music. I saw him look around the study for the source of it. He seemed mildly uneasy as I walked him to the front door. He seemed calm enough when he said he would send someone to take the body. However, his footsteps became very quick as he went to his horse. 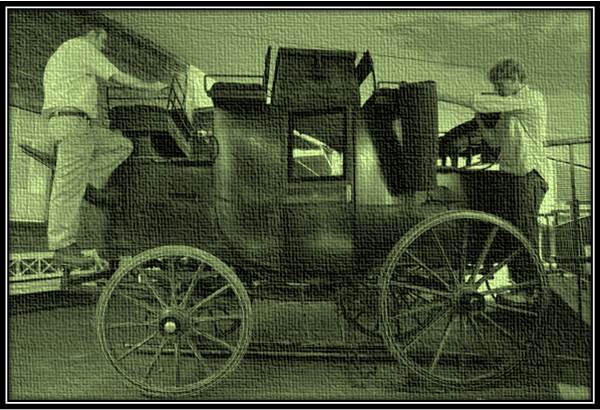 By then the dust stirred by the coach was all that remained of the officiaries from Merciful Haven Orphanage. I returned to the study. Something had caught my eye on the desk when the sheriff moved the corpse to check his face. It was an envelope addressed to Calvin Hixon. I had only glimpsed the return address, but I thought I’d seen a notable name. I grimaced as I moved the corpse enough to retrieve the letter. That was interesting, I thought as I read the envelope. I had not been mistaken about the sender. I removed the stationary from the envelope. It was a businesslike missive, complimenting Hixon’s project. I had no idea Hixon was an inventor. Perhaps it was a hobby. The letter was an offer of collaboration to improve a design belonging to Hixon that the writer called a hydrofoil. The letter was signed by Alexander Graham Bell. “Ah yes,” I thought. “The telephone man. And another Bell.” It seemed that bells of one kind and another had surrounded me ever since I arrived. I reread the letter, trying to comprehend the idea of a boat that sat on “foils” that lifted it out of the water, allowing it to reach amazing speeds. Could it actually be made to work? Hixon’s invention had attracted the interest of someone like Alexander Graham Bell, so it must be worthwhile. Was it related to his disappearance? Did it have anything to do with the corpse beside me? At that moment Copper ran into the study, followed by Cornelis. Both laughed merrily at the fright they had given the child’s would-be guardians. Cornelis picked up the intricate silver bell and gave it one harmonic chime. The organ in the back parlor responded by making a comical oboe-like sound. I look forward to seeing you again next time when the things/ingredients for Episode-4 are from Andrea Stephenson at Harvesting Hecate, Thoughts on life, writing, creativity and magic. Andrea’s blog is one of my favorites. So tune in again next weekend for her episode. … But what ever am I going to do with owl-shaped lamp? Now for this week’s recipe! I always hope to use a recipe to match one of the food-related things — and to find it on the site of a regular commenter. However, there weren’t that many recipes that included quail’s eggs. So once again I scoured the WordPress countryside. 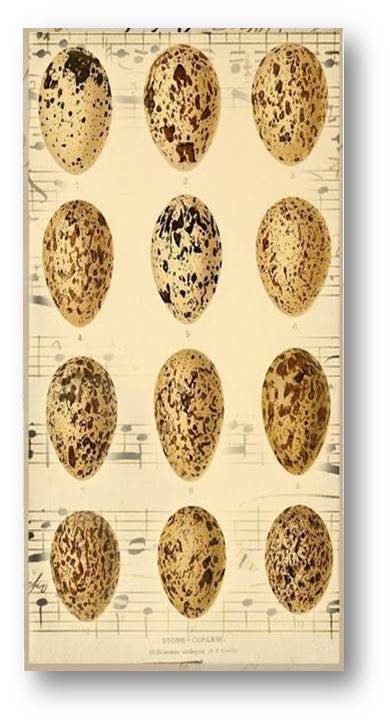 Now I’m glad that quail egg recipes are scarce, else I would not have found a delightful blog, Cooking in Sens! It’s by Rosemary, “an American living in Burgundy, France.” I hope you’ll enjoy her blog as much as I did. No part of this book may be reproduced, scanned, or distributed in any printed or electronic form without permission. Please do not participate in or encourage piracy of copyrighted materials in violation of the author’s rights. All images are either the property of the author or from Pinterest unless stated otherwise. Posted on January 31, 2015 by Teagan R. Geneviene •	This entry was posted in Three Things (Parent), Three Things: Copper the Alchemist & the Woman in Trousers and tagged Copper the Alchemist & the Woman in Trousers, Hydrofoil, Quail’s Egg, Wurlitzer Organ. Bookmark the permalink. just loved it! you have finally started a new story! Hi Lorna. It’s so good to see you here! Thank you so very much. I have not given up Atonement-2… i just wish i had more time for writing. Although the way things are, i should be careful what i wish for! LOL. Hi Kathryn! A Superb Owl party? That sounds much more to my liking than the usual. LOL. How cool. 😀 I hope you post some pictures. Teagan, what an engaging read this was! I’m a bit behind on my reader board because we hosted a Superb Owl party yesterday. I actually gasped in delight when I read your “aside” about how to fit an owl-shaped lamp into your next episode! I absolutely love owls, and have about 15 of them surrounding me in various forms and materials – really! I anxiously await your next post. Big Hugs! > Your post today is very compelling — lovely. Huge hugs! 🙂 Yep, that’s pease pudding. If only I could send you some to try, but it wouldn’t keep in the post! You can get it in cans but it doesn’t taste the same as fresh. Maybe the next time you ask for ingredients I’ll give you another regional speciality!! Neither did I, Christy! 😀 That kind of thing is the core of these serials — the fact that no one (even me) knows until the next set of things/ingredients come along. I’m glad you enjoyed it. Huge hugs! David threw you some interesting ones here – well played, Teagen! I like this phrasing you used, “indecision painted her face” – very well written. I didn’t expect that letter from Alexander Graham Bell! Thanks Sarah. Yes — rollin’! Charming as always, Teagan. Roll on next weekend! Why thank you, Tess! And i loved the three “Vs”. That’s pretty good for Cornelis, particularly, since he’s… well… I’ll actually tell more about that in episode-5. Huge hugs to you & Nando. Really fantastic Teagan, I am so enjoying this story, you seem to really be one with these characters, they come to life as I read. I really love this story line, it’s mesmerizing. Can’t wait for more. Great episode this week. One day this week, I watched a cooking show on TV where their final task was to use quail eggs. Touchy little buggers, and it didn’t seem like they were too easy to peel when boiled. I like the way you eased your quail egg right in your story. Sunshine super hugs my friend. Thank you Mihran — that is a lovely compliment. Teegan – I thought I was watching on Television screen and enjoyed your presentation! No words! Teagan’s serial gets better and better with the mystery deepening and the excitement building… episode three … with more than a few twists and turns. Sally, you are such a treasure! Thanks for reblogging this episode. I hope your readers enjoy it. Mega-hugs! Hi John — thanks so very much! Tune in next weekend… I suddenly added something from the “Story Reading Ape” to that challenge. Tour de Force Teagan. You handled three tough ones with such skill. Well done. Thank you so much, David! I had a great time writing about your ingredients. Originally i thought they might escape something using a hydrofoil, but as it turned out, it (and the Wurlitzer too) might show up many times in the future in stead. > Wishing you sweet dreams for your “Diary” posts, and may those pesky gods leave you alone. 😀 Mega-hugs my friend.